Lycium fruit is used extensively in Chinese herbalism. The fruit are the berries of Lycium chinense and more commonly Lycium barbarum. The roots also have healing properties. Lycium is a shrub that grows to about 12 ft (4 m) in height. It grows wild on hillsides in the cooler regions of northern China and Tibet. However, it is also grown as a cultivated plant in almost all parts of China and in some other regions of Asia. Lycium fruit is rich in carotene, vitamins B1 and B12, and vitamin C. The fruit also contains amino acids (the building blocks of proteins), iron, and trace elements essential to the body, including zinc, copper, selenium, calcium, and phosphorus. The bright red berries are usually harvested in late summer or early autumn. The roots are usually harvested in the spring, although they can be dug any time of the year. Berries and roots can be used either fresh or dried. 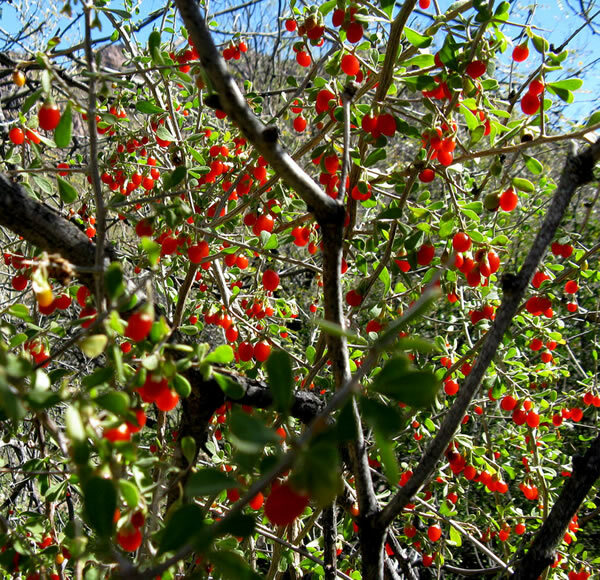 Lycium is also called Chinese wolfberry. Its Chinese name is Gou Qi Zi. The first recorded use of lycium fruit as a medicinal herb is from the first century A.D. For thousands of years it has been used in China to promote a long, vigorous, and happy life. It is used as both a jing (yin) tonic for liver and kidney, and as a blood tonic. In the Chinese system of health, jing is an essential life substance. To remain healthy, yin aspects must be kept in balance with yang aspects. Ill health occurs when the energies and elements of the body are out of balance or in disharmony. Health is restored by taking herbs and treatments that restore this balance. Lycium fruit is traditionally believed to have many different effects upon the body. In addition to being a general longevity herb, it is said to raise the spirits, fight depression, and increase cheerfulness. Berries are made into a blood tonic that is given for general weakness, to improve circulation, and increase the cells’ ability to absorb nutrients. When blended with more yang herbs, lycium is used as a sexual tonic. In Chinese medicine, the liver is associated with the function of the eyes. 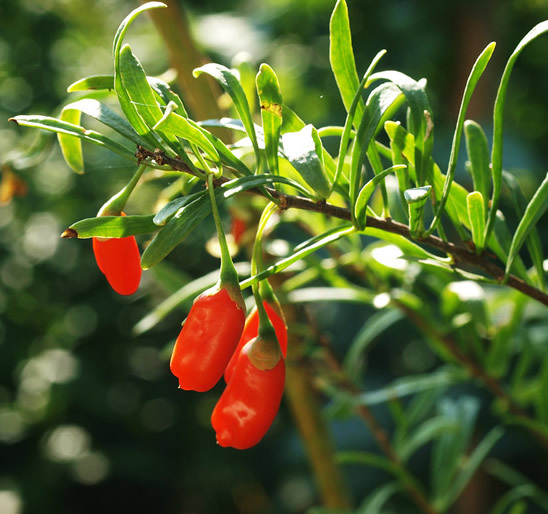 Lycium berries are used as a liver tonic to brighten the eyes, improve poor eyesight, treat blurred vision, sensitivity to light, and other general eye weaknesses. One of the qualities ascribed to lycium root is that it “cools the blood.” It is used to reduce fever and to treat other conditions of “excess heat.” These include traditional uses to relieve excess sweating, stop nosebleeds, reduce vomiting, and treat dizziness. Some herbalists use a tea made of lycium root and Scutellaria (skullcap or Huang Qin) to treat morning sickness in pregnant women. Lycium is also used to treat certain types of coughs and asthma. Modern herbalists use lycium roots to treat high blood pressure. There is some scientific basis for this treatment, since extracts from the root have been shown in laboratory experiments to relax the involuntary muscles, including artery muscles. This relaxation lowers blood pressure. Other modern scientific studies have shown that extracts of lycium root can reduce fever, including fever associated with malaria. 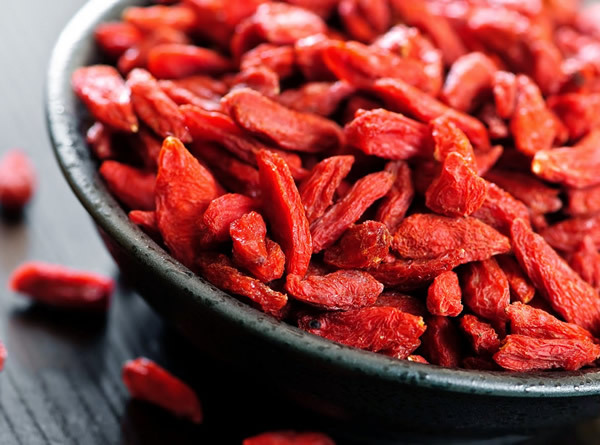 One Korean study published in 1999 looked at the effect extracts from the berries and roots had on the blood of mice that were exposed to whole body x rays. They concluded that the mice that received doses of root extract replaced leukocytes, erythrocytes, and thrombocytes faster than those that did not receive the extract. This effect may account for lycium’s reputation for creating good health, vigor, and long life. High-quality, fresh lycium fruit has thick flesh, few seeds, and a delicious sweet taste. It can be eaten raw on a daily basis to promote general health and happiness. Dried berries can be used just as raisins are in cooking. Herbalists also make a decoction from dried, chopped lycium berries. To treat eye problems, about 0.5 cup (100 ml) of decoction is consumed daily. Roots are used either fresh or dried. About 0.5 cup (100 ml) of root decoction daily is given to reduce fevers. A tincture can also be made of the root. About 0.5 teaspoon (3 ml) diluted with water three times a day is taken for coughs. Lycium is regularly used in tonics and herbal formulas that treat blood deficiencies, poor kidney function, and liver depletion. Among these are lycium formula, a blood tonic that is intended to strengthen the entire body and brain. Lycium is an ingredient in rhemannia eight combination, a common jing tonic for older men and women that is said to regulate blood sugar and control diabetes, and a vision formula with the Chinese name of Qi Ju Di Huang Wan is made of lycium, chrysanthemum, and rhemannia. Chinese herbalists do not recommend lycium for people who have a fever due to infection or who have diarrhea or bloating. There are no reported side effects from taking lycium. Lycium has been used for centuries, both as a healing herb and as a food. Lycium is often used in conjunction with other herbs with no reported interactions. Since lycium has been used almost exclusively in Chinese medicine, there are no studies of its interactions with Western pharmaceuticals.